March Botanical tapestry shows a beautiful work from Robert Furber's Twelve Months of Flowers from 1730. Furber (1674-1756) was an English botanist who depicted the 12 months of flowers each celebrating a collection of flowers prominent in that month. Here in early Spring, we see the beautiful blooms of 30 flowers, including tulips, in decorative urns, in this case, with Greek gods and goddesses on the vase. The color palette in March is gorgeous, as it celebrates the coming of Spring time. The multitude of colors in the blooms, with the green foliage, produces a beautiful work of botanical study and art, all at the same time. 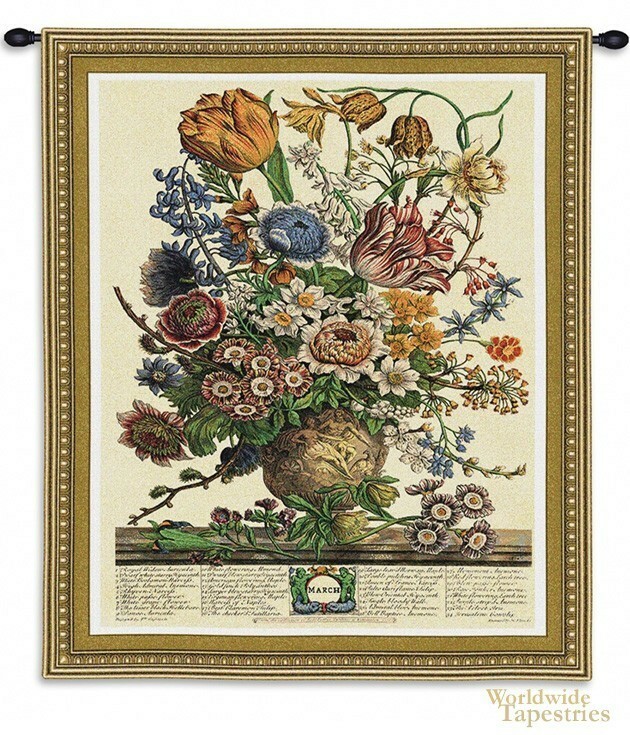 March Botanical tapestry has a lining and a rod tunnel for easy hanging. Note: Tapestry rod and tassels, where pictured, are not included in the price.